Jerome Stontz is more than our Email Operations Manager–he’s also a certified brewer with his own line of beers. This jack-of-all-trades talks brewing, food, and how he invited a celebrity to his wedding. I started as a homebrewer about 4 years ago. I did it for a little while, entered some competitions, got some good feedback... Shari (my fiancée) and I were supposed to move to Oregon, but it fell through. In a panic to find a place to live, we stopped at this burger joint, and were talking to the owner. We mentioned that I was a homebrewer, and she asked if she could have some samples of my beer. A few days later emailed me about brewing exclusively for their restaurant! Unfortunately, she wasn’t ready to invest in the equipment yet. So we went through a couple rounds of investors, and finally got funding to buy our first fermentation tank. We work with another brewery, where we pay them to use their equipment and space, but the tanks and barrels are ours. In 2016 we got our final state approval to brew and distribute. That’s what allowed us to start actually selling! There’s a bulldog on your can! It’s called Bold Dog Beer Co. In the 12-1300s, English bulldogs were known as “bold dogs.” I designed all our branding based on our old dog, Beefy. We’ve got two now named Charlie and Vinnie. So clearly you’re a visionary in the beverage department, what about food? I’m a pretty good baker actually, but what I’m best at making is ribeyes, or this recipe I stole from my mom: giant pasta shells filled with taco meat and topped with crushed tortilla chips and melted cheese. My claim to fame dessert treat is a pan with chocolate chip cookie, frosted (cream cheese + powdered sugar + peanut butter) and topped with crushed peanut butter cups and chocolate shell. My background is traditionally in graphic design. Originally I wanted to be an animator - old school, Disney, hand-drawn cartoons. But my art teacher in high school nudged me into graphic design. I was good with computers–my 7th grade science project was building a computer from scratch. I took web design as an elective my senior year of college. I was mostly doing production design, but then I was offered a job in Naperville doing some website updates. Their email guy left and I volunteered to take his spot. From there, I was good at it, and every job since then has been email development. I was on Oracle’s team for awhile, and then I came here! What would you email them about? I’d ask if I could hang out with them. I’ve been into music for a long time - I play guitar (electric & bass), I have two drum kits (live & electronic)... I always loved to draw, and still draw when I can. Soon, Shari and I are going to Europe - Dublin, Brussels, Brughes, Munich, etc. We’re going to check out so many breweries! WWAWKD - What Would Andrew W.K. Do? (He would party.) If i’m in a bad mood, I will turn on “Party Hard” and it puts me in a better mood. I invited him to our wedding since he’ll be in town playing Riot Fest that weekend. I’m not sure if he’ll come but that would be awesome. We sent him a Save-the-date. Meet our creative director, Kent Henderson. 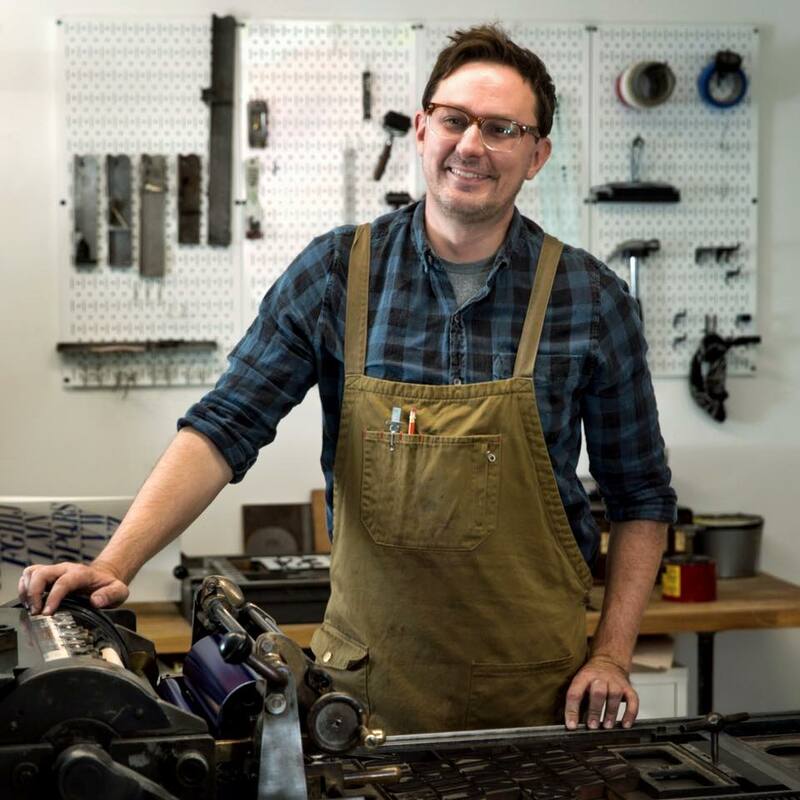 When he’s not bringing his massive design skills to Den Aviary, this Illinois native is up to his elbows in art projects at his letterpress studio. I’m a printmaker - I do letterpress and silkscreen. I like to transform my design skills into inky art projects. Plus, I look good in an apron! You grew up in Illinois. What’s the farthest you’ve ever been from here? I went to Amsterdam over a Christmas holiday once. Cool! Is that your favorite place? I love the Wisconsin Dells. Any Wisconsin destination - we went all the time as kids. I don’t think I have a specific “place,” I just remember walking around doing a lot of putt-putt golf. In case you’re wondering why the name Den Aviary (or even if you’re not), here’s the story. Way back in the early 90’s a friend had introduced me to the band Jawbox. J. Robbins, singer / guitarist / producer, became a huge influence on my love for music and went on to form the band Burning Airlines (Brian Eno reference). With their release, Identikit, in 2001 the first track was called Outside The Aviary. This was my first introduction to Burning Airlines and I just couldn’t get the song out of my head. Aside from the amazing musicians and powerful vocals behind Burning Airlines, I was drawn to the passion behind their lyrics. Plus, the name sounded pretty cool. In recent years, I’ve taken an active interest in finding out more about my family heritage. My mother’s side of the family is Danish. I’ve since taken multiple trips to Denmark (one being my honeymoon) and have fallen in love with the culture. The word “the” in Danish is “den”. Therefore, Den Aviary is simply a mashup into “The Aviary”. It’s unique, has personal meaning and I like it. Strategy is defined as ‘a plan of action or policy designed to achieve a major or overall aim.’ Whenever I work with a client I think about this definition. I do this because it is strategy that will define whether or not a campaign will be successful. The tools are important for executing your strategy but do not make it successful. As agencies/people we have access to the same tools and software. How we use those tools is what differentiates successful campaigns from failed ones. 1. Understand what the client needs. The foundation of every great digital strategy comes from understanding that what the client wants might be very different from what they need. This may sound obvious, but it is an issue I constantly see in the industry. Agencies create these elaborate and quite frankly stunning decks that wow the clients. They tell the client how they plan to utilize search retargeting and dynamic keyword insertion to increase revenue, without understanding what the client actually needs. They don’t challenge their clients, so they become a production-based service agency rather than a partner. When you are a partner you can share in honesty with your client and vice versa; both people in the relationship trust each other because a successful relationship benefits both parties. This, in turn, allows for an open and honest dialogue about what they need instead of what they want. 2. Data is your ally. Embrace data. Let data guide your opinions and not the other way around. There are so many tools that give insight into consumer behavior. Spend time setting up your preferred analytics tool and dashboards. I personally love Google Analytics because it is easy to use, has a relatively simple UI and it’s FREE. Even if your platform is Core Metrics or Webtrends, the process is the same. Create documentation around your data set-up, so that when you look back there is complete transparency. Testing and learning may not technically be part of the initial strategy, but it is vital to success on any campaign. For example: When we roll out ad copy for search, it is always with the intent to optimize toward better performing ads. So we roll out two to four variations of headlines and body text. Yes, there are details that you need to understand and work through to have a successful test but I think it can be generally summarized by these three questions. Why do we want to test? Knowing why you want to run a test can save you time and resources, even if the answer is no test is needed. This means resources can be spent adding value to a campaign. How are we going to test? Is this a simple A/B test, what platform should the test be performed on and how long should the test run for. Asking these questions before hand we result in actionable insights. With that, it is important to understand that actionable insights can mean taking no action. What do we expect the results to be? This is your hypothesis, “Dynamic ad copies have higher click through rates but the users are less likely to convert”. Den Aviary is proud to announce the addition of Lee Rosenthal as SVP of Client Success. He will work with new and current clients to support and grow the relationship with Den Aviary, as well as run the agency’s newly opened New York office. Lee comes to Den Aviary with more than 25 years of marketing and business development leadership experience in small and large organizations across both B2B and B2C functions. He brings a strategic approach to customer-centric marketing, with an ability to roll up his sleeves and deliver needed work with and for our clients. Rosenthal will be charged with ensuring client growth and success by proactively working with clients to develop broader strategies and programs that support key business initiatives. “Having worked with Lee in the past, I knew his leadership qualities and work ethic would be a tremendous fit for us, said Den Aviary President and Head of Strategy Jason Sisley. “With our growth over the past five years, maintaining executive-level relationships and ensuring success with all of our clients is a major part of our continued growth. Lee fills this need perfectly and simultaneously accelerated our expansion into New York City." Lee is a graduate of Northwestern’s IMC program and worked at Classified Ventures/Apartments.com, Rewards Network, Bally Total Fitness, Experian and most recently, at Return Path. Our success at Den Aviary is directly tied to our ability to work with you, our clients and partners, to create customer value that builds long-term business results. We’ve built into our DNA a practice that is based on endless planning, execution and optimization, and intelligent decision-making that all aligns with your overall business metrics and goals. In line with that thinking, we’ve had quite a busy first four months of the year: lots of exciting work, new hires and even a new office location. Along with that, we have renewed our commitment to getting new, fresh content out to the blog (starting today! ), and our up-and-coming topics cover everything from performance media to creative to digital strategy. We believe that the things we’ve been busy with provide us with great experiences, resources and knowledge that we can leverage for you and keep delivering quality, world class solutions. For starters, we’re excited to announce the addition of Esosa Ogbomo to our Performance Media team! Esosa comes to us most recently from Frequency 540 and Starcom MediaVest and is super qualified to lead the charge for us in all things paid media and web analytics. Job number one is to establish our positioning in performance media, and begin to extend our capabilities in areas where you need our strategic thinking beyond email and into the other digital channels where we need that expertise. We’re very happy to have Esosa and already have him well entrenched on both existing client work and new opportunities. We’re also very pleased to welcome our good friend and colleague Lee Rosenthal to Den Aviary as our SVP of Client Success. Lee’s a graduate of Northwestern’s IMC program, spent time at Classified Ventures/Apartments.com, Rewards Network, Bally Total Fitness, Experian and most recently at Return Path. Just about everyone here at Den Aviary has had the pleasure of working with Lee at other stops along our distinct paths; we’re now proud to have him on our team ensuring that your needs are met and that we’re always finding better ways to work together. Which brings us to our third piece of good news for the day… everything that we’ve been building up for in Q1 of this year was to use our recent growth as a springboard into a new market. And with the hires of both Esosa and Lee, we’re proud to announce the opening of a new Den Aviary office in New York! Lee will run the New York office fulltime from the Financial District downtown. Esosa will be based the in Chicago but will be instrumental in raising the stakes of our media practice to provide a great fit for the New York marketplace. As you can see, we’re excited about these opportunities and excited about where we’re headed. We’re very committed to your success and we’re making good, smart investments in making certain that we’re where you need us to be. In the coming months we’ll have more good news to share – in the meantime please join us in welcoming Esosa and Lee and as always stop by to see us, now in either Chicago or New York! We use data to communicate with our customers. But what happens when the data we intend to share, shows up differently than what we expected? Data quality – the idea that data in question appropriately serves the business function for which it is intended – is an important concept. It is also important to note that the business needs demanding that data can expand over time, outgrowing those original quality specifications and leading to unanticipated results. For example, what happens when a newly implemented external marketing platform exposes data as dynamic content to your customer base? An organization may assume it has done its due diligence if the data is fit for previously defined business purposes it was intended to serve. This is a dangerous assumption however, and can lead to campaign development challenges, content issues, and ultimately a decline in customer perception of your brand. Whether it's due to an internal data technology team not fully comprehending the complexity of a given platform, or data being offered up to the customer that has never been previously leveraged externally, or simple corruption due to mundane encoding issues ("UTF-huh? "), blunders are more common than you may think. Product descriptions looking like someone ran them through a virtual paper shredder, irrelevant customer service notes appearing in unexpected fields, and other such manifestations can negatively impact the customer’s experience. Regardless of the cause, the result is the same: your brilliant dynamic digital marketing effort ends up looking like it was put together by an inebriated robot. Simply having data isn't enough. You must make data quality a core aspect of your marketing system implementations. A good rule of thumb is that if data isn't suitable for website presentation, it's probably not suitable for presentation in any other digital media. An example of such data might be any data that was keyed in by a customer support representative - ask Comcast about how this can go wrong. While in the Comcast case the issue showed up in automated paper billing, you get the idea. The people entering the data in a particular field (or creating the processes that do so) may not have any idea that it might be exposed to parties outside the organization. Communication is key. Make sure the data team in your organization understands what you are doing with this data, beyond simply needing it. Data being leveraged for customer segmentation and business rules has a different set of quality considerations and implications than data being purposed for content. Take nothing for granted. Your data team may know something you don't. Something that could save you from embarrassing your brand in front of your entire base ... or worse. Misattributed data such as address data showing up in name fields, price data showing up in product names, and other such mistakes. Encoding errors, which are special characters, and sometimes not-so-special characters, showing up as gibberish in your generated content. This is typically a result of character encoding inconsistencies between your internal data system and your marketing system. This can be avoided by being sure the correct encoding scheme is being leveraged (e.g. UTF-8), or developing a solution that replaces these characters with their HTML character references, either within your marketing platform or upstream in your data sources (this may require further cooperation from your data team). Case issues, where data isn’t appearing with proper letter case. For example names where the first letter is in lowercase, product names that are entirely in uppercase, and so forth. In robust marketing systems, it is often simplest to handle these with functions to appropriately convert the case within the system itself. At the end of the day, it all comes down to communication and cooperation with your data resources, broad testing, and careful consideration of where the issue would be most efficiently addressed, be it upstream in the data source itself, within the marketing system’s functionality, or somewhere in between. It is easy to overlook the importance of data quality, and the many points at which it can go wrong, when you'd rather focus on your message and creative. But taking the time to ensure that the data you are dynamically presenting is what you want it to be is a key element to a successful campaign.